Whoop, another one for the trophy cupboard! Now this award comes with some rules. Gotta read the rules people. Rule 1: Reveal seven secret things about yourself. SEVEN??? I have already divulged my secret love for Jeremy Kyle, Billy Joel and, *whispers,* my teenage crush on one C Hawkes. What more is there to give? I will give it a go. 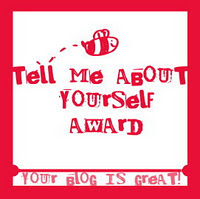 Rule 2: Nominate fifteen other deserving blogs to receive the award. Holey moley. Fifteen? This award is a toughie! Right then. Seven secret things. I pick my baby’s nose, a lot. I have a phobia of bananas. I CANNOT and HAVE NEVER peeled one. I also have a phobia of walking over three drains in a row as I was once told it was unlucky. In fact I used to be able to draw a map of my route to work and could outline every single set of drains on there. My geography knowledge is appalling. I am not even sure how many continents there are or what ‘Oceania’ even is. My sense of direction is also appalling. I once got lost in Selfridges and took me an hour to find my way out. I am a seriously bad driver and only passed my test on my seventh attempt. I threw up in the second one. Driving test that is. So, there you have it. A little more that you now know about me. Me-time Schmee-time. AKA The one with Jeremy Kyle. Mix-tape Monday: Guilty Pleasures. AKA The one with Billy Joel. Listography: Top Five Famous Folks I Used to Fancy. AKA The one with Chesney Hawkes. *phones Sharleen Spiteri from the band Texas* Hi Sharleen? Hi darling! Yeah, yeah I’m good, how are you? Oh great. Well, look I need a favour. Yeah. Could you just actually be my friend? Cos now people think you are. Yeah. And it would be STUPID if you weren’t, right? So, can you? Hello? Hello? I don’t know WHERE the banana thing came from but even a whiff of them makes me want to retch. Odd eh? I have already commented on this post but its not showing. Weird. Thanks for the award matey. Had a twisted fascination with picking cradle cap for a while. I disgusted myself. I have a similar banana phobia….which I will also be mentioning in my secrets. Cannot eat one without completely dissecting and investigating it! Ha ha.